Groundhogs are usually classified as a pest species due to their habits of digging and eating crops. Woodchucks are considered agricultural pests, since they love to eat a wide variety of crops. However, their burrowing habits often cause a bigger problem. Horses can break their legs by stepping into burrows, and when a groundhog digs under a house or deck, the removal of soil can undermine the foundation. 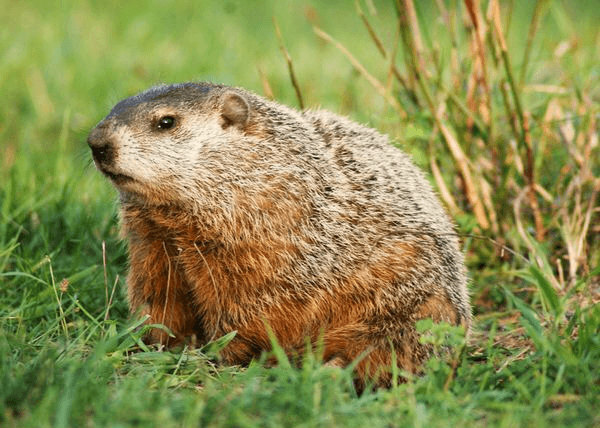 Groundhogs (Marmota monax) are rodents, and adults average 8-10 pounds. They give birth in spring to 3-6 young. They can live up to six years in the wild. They are primarily herbivorous, eating a wide variety of plants. HOW DO I GET RID OF GROUNDHOGS? The best method is trapping and removal. If you simply block off their holes, they will dig them out again. They can't be poisoned. They can be live trapped in cage traps or caught in lethal body grip traps. Many people try various repellents to get rid of groundhogs - everything from mothballs to fox or coyote urine. However, none of these are effective. The only sure means of woodchuck control is trapping and removal. No important diseases associated with groundhogs.